Every time you Follow a Hubber, you have the option to leave him or her some Fan Mail. Fan Mail is one of the clearest ways to share the love on HubPages, as it’s all about highlighting what you love most about the person you have chosen to Follow. In addition to boosting another Hubber’s mood for a spell, your Fan Mail has the potential to give someone else the much-needed confidence to publish something truly extraordinary. We’ve all had moments when we have held our talent back because of a lack of confidence. Wouldn’t it be nice if someone popped out and complimented us in our moments of weakness? By leaving Fan Mail for another person, you might just become that person- and really make a difference. Because you can only leave Fan Mail once, we recommend taking some time to think about what you would like to say to the Hubber you have Followed before submitting the message. If you are not ready to send Fan Mail right after you Follow someone, don’t worry! You have the option to move on to something else, then return to that person’s Profile to leave Fan Mail when you are ready. When we ask people why they love HubPages and chose this platform over others, they often refer to comments they get from fellow community members. Indeed, leaving insightful, meaningful comments on others’ Hubs is one of the most effective ways to spread the love on HubPages. While leaving good comments does take time, it is a great way to make new friends on HubPages (and win over some Followers, too!). Making a point of providing detailed feedback on others’ work can help you read things with a new level of attention and think more critically about what it is that makes a successful Hub so successful. Of course, a great comment can also make a Hubber’s day- who wouldn’t want to pass up the opportunity to do that? 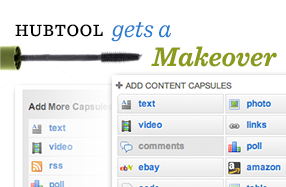 It has been a while since the HubTool has gotten some TLC, so we decided to spend a little time giving it a makeover, which will go live next week. We have made no big changes to the way things work, just a few cosmetic tweaks to clean things up and take advantage of some of the new capabilities of modern web browsers. The first change you may notice next week is that the summary field has been moved and is now located under the title. Summaries are used on the HubPages Topic Pages and, if you write one, included in the meta description tag that search engines may show in search results. We haven’t changed how the summary is used on the site or in search engines; only its placement in the HubTool has been adjusted. We hope the box’s new placement makes it a bit easier to find for our new (and long-time) Hubbers. Another change we have made is that capsules’ edit buttons now only appear when you move your mouse over the capsule in question. This provides cleaner view of the Hub and more effectively indicates which buttons act on which capsule. What’s more, alerts and messages have been reorganized, the tips that used to appear have gone away (perhaps to resurface in a different form in the future), and the buttons have taken on a fresh new look that makes it easier to tell when you can use them. There’s still work to do and we’re not stopping with these changes alone. 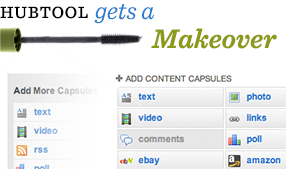 Some of you may also notice a few other changes as we begin being beta testing some new ideas. If you spot one of these features, we’re looking for feedback so please feel free to provide it through the link provided. On HubPages, we’re all about giving as much as you get, which is why Weekly Topic Inspiration is such a fun way to spread the love in our community. This weekly challenge is all about sharing and getting feedback on your work- as well as constructively critiquing the work of others. 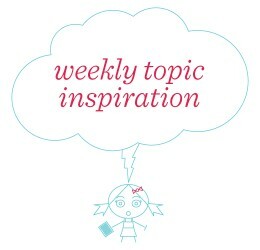 Weekly Topic Inspiration involves the selection of a new theme each week- one on which Hubbers are encouraged to write. Throughout the week, Hubbers post their Hubs as Answers to the Weekly Topic Inspiration Question and also share them in the week’s official forum (the current theme’s thread is always stickied). By sharing your Hub in the thread, you can get valuable feedback on your work- as well as encouragement. You can also lend other Hubbers a hand by providing them with feedback on their own work and offering some suggestions on how they might make it even better. If you’re looking for something to write about or hoping to make some new friends on HubPages, Weekly Topic Inspiration is a great place to start! Many discover talented new Hubbers by chance, but by keeping tabs on each week’s Rising Stars, you can find our best new members in a jiffy. 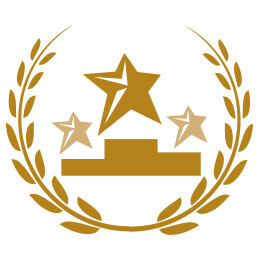 The Rising Star Program on HubPages nominates eighteen Hubs each week, which are selected from three different Topics. These Hubs are showcased on their native Topic Pages for five days in special carousels, which invite visitors to vote for their favorites. The three Hubs from each Topic at the end of each week that win the most votes win their authors Rising Star Accolades, and are also featured in our weekly HubPages Newsletter (weekly winners are also announced on Wednesdays in the Forums). As you can see, this experience can be very instructive! One of the best ways to share the love on HubPages is by Hopping Hubs. Your ratings of others’ Hubs will determine whether or not they are Featured, so your activity has a real impact on the community- plus Hub Hopping can be a great source of inspiration. There are two important parts of Hub Hopping: rating and reporting. After reading a Hub you have Hopped, you can rate it by adjusting the scoring bars to the top left of the screen. If you’re not sure how to rate a particular aspect of a Hub, slide the bar around and read the descriptions below to find a set that best describes the Hub. If you come across a Hub that is poetry or creative writing, check the “article is creative writing” box to get a more appropriate rating scale. Though we hope you will only see good Hubs in the Hopper, there is a chance that you will find Hubs that do not conform with our publishing standards (e.g. are spam, are written by someone under 18 years of age, have pixelated images, encourage illegal activity, etc.). 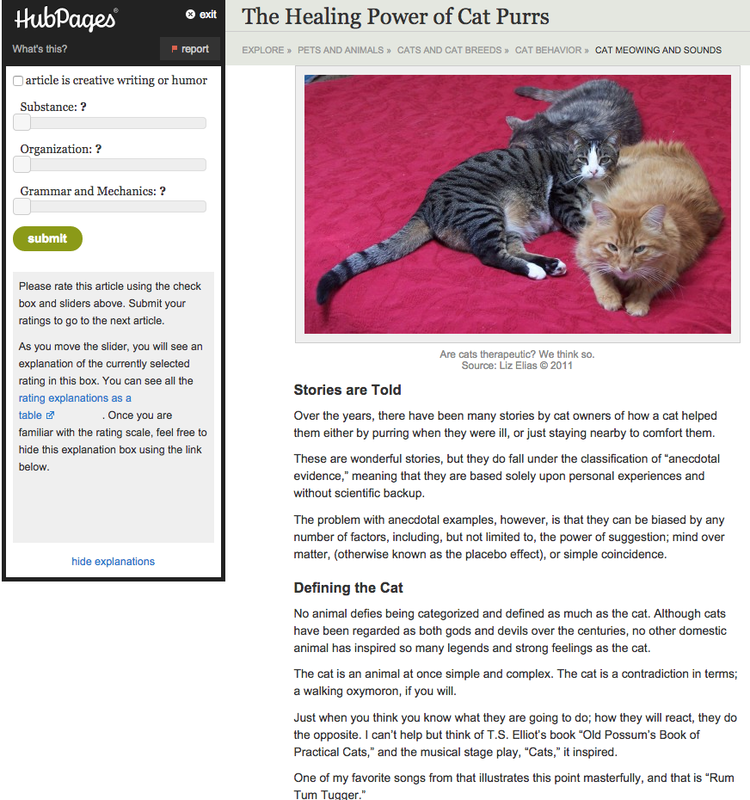 To get an idea of what should be reported on HubPages, stop by our Learning Center Video with tips on reporting Hubs. Should you find a Hub that should be reviewed by our support team, please click the report link (with the red flag next to it) and select your reason for filing the report. Hopping Hubs is like cultivating a garden- you can help beautiful plants grow, pull out weeds, and be inspired by the scenery. We hope you give it a go! While it can be very helpful to share your beautiful photos with others on HubPages, some of the most valuable commodities on HubPages are support and advice. Simply by giving a Hubber a helping hand, you can do an immense amount of good. Those who were met by a friendly face on HubPages will know what I’m talking about! Sending a Hubber an email letting him or her know which Hubs you like most and what it is you liked about them (you can send Hubbers emails by going to the Fan Mail tab of his or her Profile (pictured above) and clicking the “send [Name] an email” link”). Leaving a comment (that you ask be deleted) on a Hubber’s Hub when you notice a typo so that the Hubber knows to take care of it. Leaving a friendly, welcoming comment on a new Hubber’s Hub. Stopping by the HubChallenge Forums and cheering on people who have pledged to meet new HubPages goals. Good Hubbers put a lot of effort into creating images for their Hubs. When they can’t take their own photos or make their own graphics, Hubbers often spend a great deal of time finding high quality images from other sources. As you probably know from our helpful guide on image sourcing and attribution, not all images have licenses that allow you to use them. It can take quite a long time to find a Creative Commons or Public Domain-licensed image that fits perfectly with a particular Hub. Because good images can be so hard to find, one fabulously good deed you can do is to share your own photos and images under a Creative Commons or Public Domain license. Creative Commons licenses enable other people to use your images so long as they follow the specific stipulations you apply to the license. For example, you might give an image a Creative Commons, Attribution, Noncommercial license (which, abbreviated, looks like CC-BY-NC). This particular license stipulates that others can use your image so long as they name you (Attribution) and do not use it for commercial purposes (Noncommercial). A Public Domain license makes it possible for anyone to use an image for any purpose without naming its creator/owner. Be careful about giving your images a Public Domain license (or even a Creative Commons license), because even though you might change your mind about the license down the line, those who find your images while they still have a Public Domain license will be free to use it as they please for as long as they like. To get the right wording needed to create a Public Domain or Creative Commons license, we recommend using Creative Commons’ Choose a License tool (pictured above), which makes it easy to develop a license they meets your requirements. While you have the option to apply a Creative Commons or Public Domain license to an image by simply adding the text the Choose a License tool produces, some sites, such as Flickr and Wikimedia commons, come with built-in photo uploading features that enable you to apply those license to your images in such a way that those images are also tagged with metadata that makes it easier for searchers to find them (this makes your images easier for needy image-searches to find). For this reason, we recommend uploading your photos to Flickr, applying a Creative Commons license, and then citing them in your Hubs just like you would cite images by another Flickr user using the same license (this enables others to see that your images are available for use).